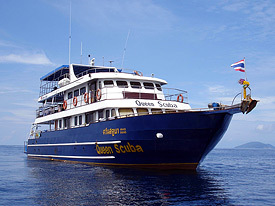 07:30 am – 07:00 pm	Three day dives around the Similan Island. Visit Island No. 4 / Enjoy our little paradise with beautiful nature & a white sandy beach. 07:00 pm – 07:45 pm	Night dive at Honeymoon Bay (Island No. 4). 07:00 am – 01:00 pm	Two dives around the Similan Islands. Visit Island No. 8 / Enjoy our little paradise with beautiful nature & a white sandy beach. 02:00 pm – 06:30 pm	Two dives around Koh Bon & Koh Tachai Islands. The above itineraries are guidelines of an average cruise example. The Captain and the Cruise Leader will decide the best course of action based on weather conditions at the specific time. We retains the right to cancel or alter the trip on the base of the safety of all passengers, crews, and the vessel!